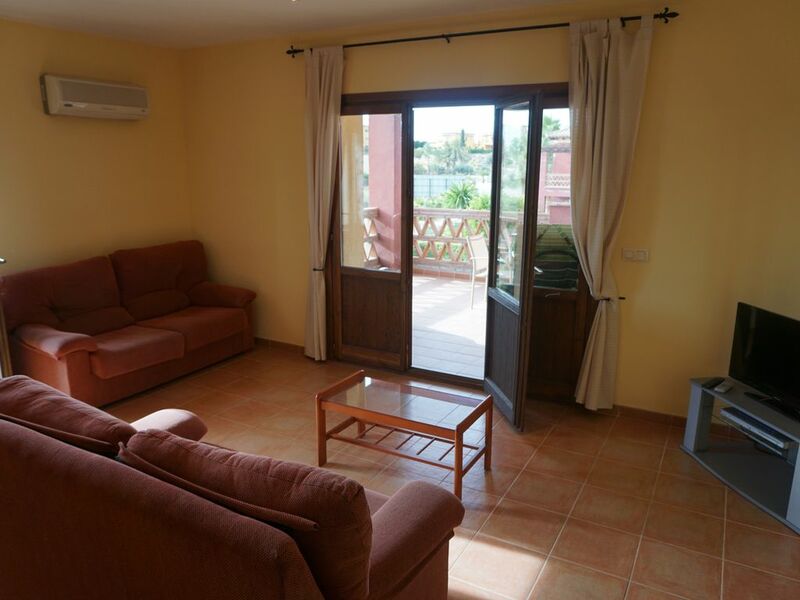 This lovely first floor two bedroom apartment is situated in “Taray”, a small gated development within the Valle Del Este resort. The property consists of two good sized double bedrooms with twin beds in each, a family bathroom and separate en-suite shower room. There is a large lounge which features two large settees, cable TV and music system. The dining area has a modern table and chairs to seat four. There is a good size fully fitted kitchen, with washing machine, fridge/freezer and microwave and an extremely large balcony overlooking the golf course with views to the sea and mountains. There is also a small private balcony area to the front with a table and chairs, perfect for catching the early morning sun at breakfast. The resort of Valle Del Este has at its centre a luxury 4* hotel whose facilities are available to those staying at Valle Del Este. These include indoor and outdoor swimming pools, spa, sauna and Jacuzzi, golf driving range, and of course, the Championship 18 hole golf course which the apartment overlooks. Guests are also welcome to dine at the hotel’s restaurant and to use its bar and other leisure facilities. Taray is situated within a 10 minute walk of the hotel and the adjoining “Centro Comercial”, where there are restaurants, bars, a shop and hair salon all boasting fabulous views of the golf course, sea and mountains. Within Valle Del Este, there are several Padel Tennis courts available for use (free of charge) as well as a small children’s play area. Free Wifi is available at the property. The nearest town is Vera, which is less than a 10 minute drive from the apartment and hosts an array of shops, restaurants and a bustling Saturday street market. Vera typifies the “real Spain”, a main square with a 16th Century church and for a real authentic experience, you could visit their traditional bullring. At Vera Playa, there is a popular water park which in the height of the summer, offers discounted late entry prices. A well-known nearby tourist attraction is the town of Mojacar, situated high above Mojacar Playa (a 5km stretch of sandy beach) with beautiful white houses and narrow cobbled streets. There are excellent views of the entire surrounding area from its central plaza where you can enjoy a nice cold drink at one of it’s several tapas bars. There really are so many beautiful and authentic areas to discover, to name just a few, we would recommend Cabo De Gato, Garrucha harbour and fish market and Sorbas with it’s caves and gorges. The area is a golfer’s paradise, in addition to the Championship course at Valle Del Este, there is the superb Desert Springs course (recently used by the England Cricket Team! ), Aguilon Golf and numerous other enjoyable courses. My name is John and I live in England with my wife and four children (and three grandchildren). We started out by just having a family holiday to the area of Valle De Este and ended up loving it so much that we bought a property here so we could enjoy coming back time and time again. You can never have enough of the beautiful sun, sea and food. We love this property as it offers something for everyone, be it a relaxing time by a quiet pool, challenging yourself to a round of golf or exploring the local areas, all are possible. Being positioned on the championship golf course is very special and the views are simply breathtaking. We love being able to enjoy the benefits of the hotel such as the spa and gym whilst having the privacy of our own apartment. We have recently installed a new air conditioning unit in the lounge. One parking space is allocated to the property, with additional spaces available on the road outside the gates to the apartment. We have WiFi in the apartment with internet and access to hundreds of TV channels. Internet is also available at Karen's Sports Bar, which is a short 10 minute walk. Free wifi is available here too. WiFi is available at the apartment. Several hundred TV channels are available. There are two pool tables available to use at Karen's Sports Bar (10 minute walk) and the hotel. There is access to a free padel court within a 5 minute walk. We are situated on a golf course and there are a number of other courses within the local area. The property is situated up a short flight of stairs on the first floor. Easy to find, Shelagh was waiting for us when we arrived. Apartment was lovely and peaceful, very well equipped. Only downside was the air conditioning unit in lounge that appeared to be faulty. Our stay was fantastic the location and grounds of the golf complex was great for our needs. The apartment was really clean and specious. Getting the keys was an easy process. Easy to self cater as large super markets are within 5 miles. Lidl Iceland and a Spanish one. Very well equipt. I would fullly recommend this apartment and will be using it in the future. Special thanks to Shelagh for meeting us and explaining about keys and giving us good information about the golf complex. Can't wait to return . Everything was perfect . Lovely apartment, very spacious and well equipped. Lovely apartment, very spacious and very well equipped with everything we needed...in a small and quiet block of apartments in a very nice location of Valle del Este close to the commercial area and to the hotel. This is our 4th time in Valle del Este and we always stay in a different property. This one was very clean and very well looked after by Shelagh to whom I take the opportunity to send a very big thank you. Some Tips for improvement: the air conditioning unit in the lounge did not work as well as the ones in the bedrooms and perhaps a small barbecue in the lovely (and very spacious) balcony. But these very small issues would NOT prevent me from highly recommending this property or from coming back. We thoroughly enjoyed our 2 weeks here and we hope to come back in the future. WE THOROUGHLY enjoyed our stay in this well stocked and delightful apartment. It was well stocked with all the basics and had a lovely balcony where we had all our meals. It is a perfect location with an easy drive to Mojacar. However, I must emphasise that unless you are staying for golf on the Estate a car is essential. We loved our trip and hope to return very soon.Shopping is easy but again need a car but once into Mjoacar there is everything including a huge and well stocked Macadona..we were greeted by the lovely Shelagh who (re arranged) and even sent my glasses back to UK which I had left under the bed! All in all a lovely week and wished we had longer. We are so pleased you enjoyed your stay at our apartment. We look forward to welcoming you again. This is a spacious and well equipped apartment in a great location to explore the surrounding area. Apartment was clean and comfortable with a very well equipped kitchen. Beds were comfortable and having a bathroom and en-suite is a nice touch. TV has BBC and ITV channels which is a boon when wanting to catch up with the news and of course the soaps! The pool is big enough to swim in and surrounded by well-kept gardens. The complex is very quiet. While you can used the facilities at the hotel, these do come at an additional cost. We would always expect to pay for SPA treatments, however based on the 'write-up' wording we thought we could use the hotel gym and pool (Gym is 6 Euros per visit and use of the hotel pool requires at least the purchase of food/drinks). All of this wasn't a major issue for us, but perhaps a tweaking of the wording would clarify things. Finally a big thank you to Shelagh for looking after us on arrival and sharing her knowledge of the local area. She as on hand throughout in case we needed her. The nearest town is Vera, which is less than a 10 minute drive from the apartment and hosts an array of shops, restaurants and a bustling Saturday street market. Vera typifies the “real Spain”, a main square with a 16th Century church and for a real authentic experience, you could visit their traditional bullring. At Vera Playa, there is a popular water park which in the height of the summer, offers discounted late entry prices. A well-known nearby tourist attraction is the town of Mojacar, situated high above Mojacar Playa (a 5km stretch of sandy beach) with beautiful white houses and narrow cobbled streets. There are excellent views of the entire surrounding area from its central plaza.